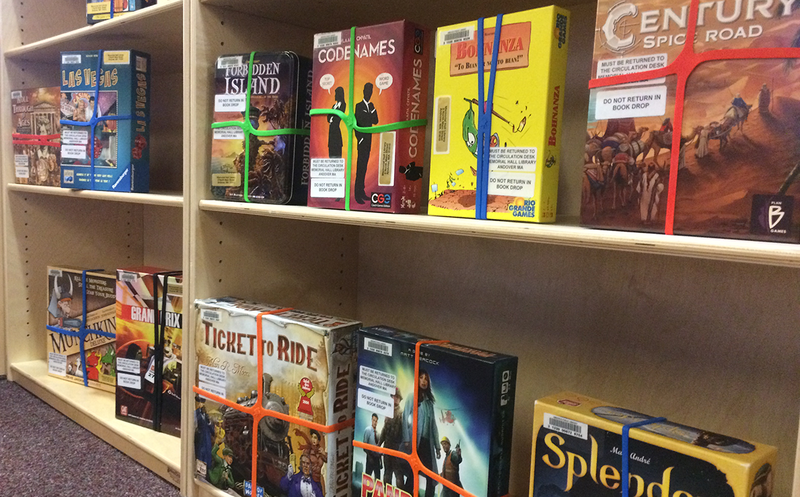 We have a collection of games that anyone is welcome to borrow or play inside the library! Those on the Games Shelf near the reference desk can be checked out for a period of one week using your library card; the others can be used anywhere inside the library. If a game's location is "Teen Room," they're on the shelves behind the teen desk and may be taken at any time. If a game's location is storage, ask at the teen desk or reference desk and a staff member will be happy to get it for you. Information about a game's suggested number of players, age range, and time to play is taken from the game's instructions (when available). If a game's name is linked, it will take you off the library's website and to the game's page on the community BoardGameGeek, which will provide instructions and crowd-sourced reviews.